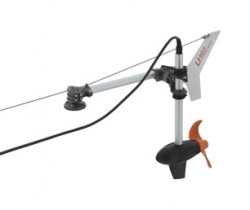 A new, longer-running model of Torqeedo’s smallest electric outboard with integrated lithium battery has been launched. The Ultralight 403 C boasts a 915Wh battery, which offers 2.85 times the battery capacity compared with the standard Ultralight 403 with 320Wh battery, while adding 1.7kg to the overall weight. Designed for kayaks, canoes and very light boats, the Ultralight 403 C, which is available for the 2018 watersports season, has a total weight of less than 11kg including the high-capacity lithium battery, a top speed of 9.8km/h and a maximum range of more than 100km at slow speed. Furthermore, it comes standard with GPS and a digital display that shows real-time power consumption, battery charge status and remaining range (time or distance). A USB socket charges a phone or powers a light or other electronics, and an optional foldable solar panel means the Ultralight 403 C can be charged in remote locations or while under way. An optional TorqTrac app displays all motor information on a smartphone or similar device, and allows users to plan a trip in advance and share the vessel’s position on a map with estimated time of arrival. “Paddlers love the Ultralight 403 and the amount of water it allows you to cover, whether you’re fishing or exploring remote areas where larger boats can’t go. The Ultralight offers increased safety and allows enthusiasts of all skill levels or physical abilities to travel together and have more fun on the water,” said Christoph Ballin, CEO of Torqeedo.